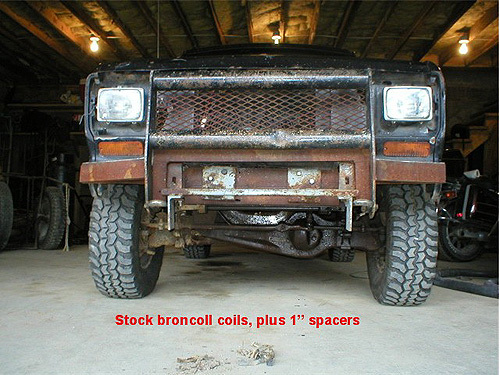 When I bought my Bronco II, it already had one inch coil spacers installed under the factory coil springs. 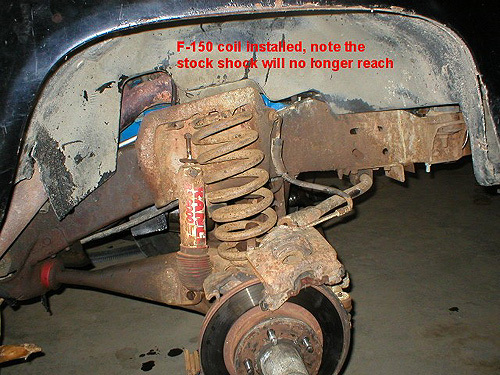 While this was fine with a V-6, the added weight of the 302, and many trips off-road took its toll on the stock springs. While looking through my garage, I spotted a set of stock F-150 coils. The overall difference in height between the two coils is only about 2 inches, so I decided to try it. The stock springs were easy to remove. Jack the rig up, remove the tires and lower it with jack stands under the frame, but do not lower the axle all the way down. 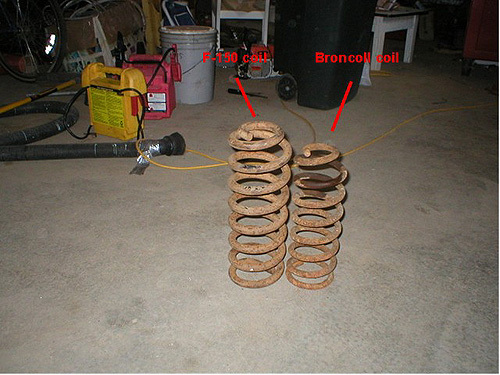 Leave the spring compressed some to aid the removal of the shocks. 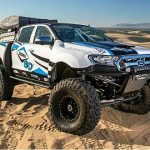 Once the rig is supported safely, begin by removing the stock shock, followed by the brake caliper and finally the sway bar end link. 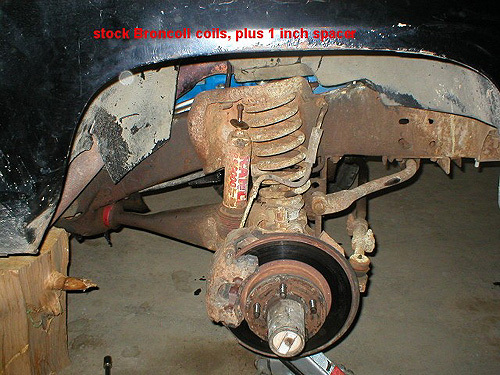 You now can lower the jack from under the front axle to relieve the compression on the spring. To remove the spring, first remove the large nut in the center of the coil by using the jack extensions, and going down through the top. Removal of the coil is down, by twisting it clockwise, to unlock it from the coil bucket, then simply pull it out. 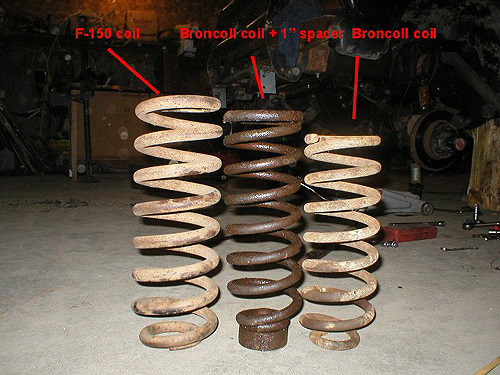 The F-150 coil is larger in diameter than the Bronco coil, which requires some modifications to the coil bucket to fit. In the top of the coil bucket are 5 locating tabs, the front two must be bent back for clearance. 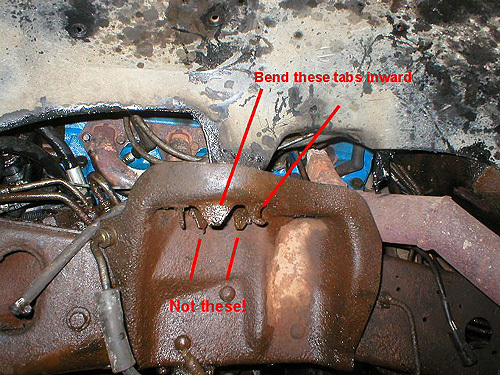 DO NOT bend the rear two mounting tabs, these must be left to ensure the coil will sit as far back into the bucket as possible. 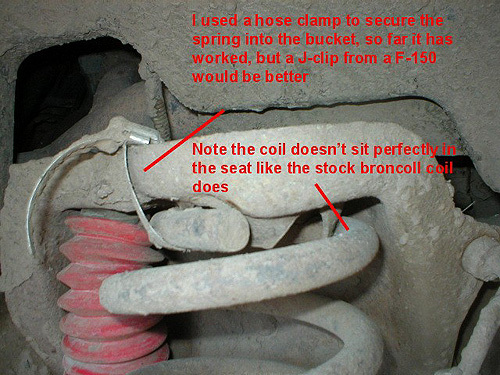 Due to the added height of the F-150 coils, they will be difficult to install into the coil bucket. I simply stood on the top of the hub with one foot to push the axle down as far as possible, and the coil slipped right in. In order to find the best spot for the coil to sit, you will need to rotate it back and forth until it sits flat in the coil bucket. The retaining nut installs the same way as before, through the top of the coil. Since the tabs are not bent back in the top of the coil bucket, they will no longer safely secure the coil spring into the bucket. The best way to fix this is to drill a hole and install a pair of mounting tabs from an F-150. I used several large hose clamps on mine, which have worked flawlessly so far. You now can reinstall the sway bar, and brake caliper. A longer shock will also be needed. 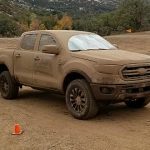 Mine was a 2″ lift shock for an F-150, which fit perfectly. 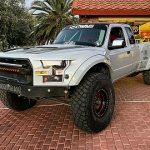 After the swap, I had gained a total of 3.75″ of lift in the front end. The ride is a little stiffer, but actually seems better because the rig no longer bottoms out over every bump. 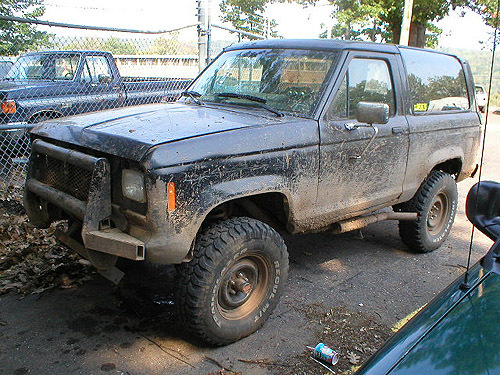 Please note that after this install, I have not tried to have my Bronco aligned. 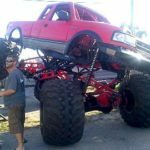 With 3 degree camber bushings, it may be possible to get within factory specs. Depending on your applications, it may also be impossible to align without the axle beam drop brackets. 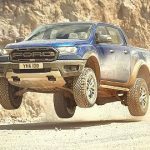 NOTE FROM TRS: The F-150 coils were only 2-inches taller than the Ranger springs, but provided 3-3/4 inches of lift. 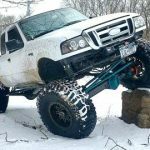 That’s because they have a higher spring weight than the Ranger coils, and aren’t going to sag as much under the weight of a Ranger. 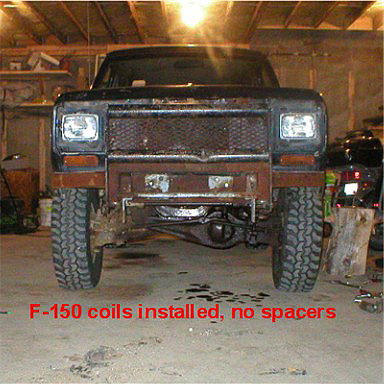 You’re not going to be able to get the Ranger aligned using F-150 coils. You’ll be able to adjust it some, but not all the way to where it needs to be. If you’ve done a V8 swap, than there is a better chance of getting it to align with the added weight on the front. This is a situation where a set of worn out coils from a fullsize Ford could actually work better. 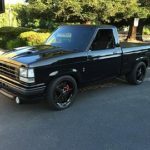 Don’t forget that the Ford Econoline vans used coils in the front as well.